1 . The most respectable gave in Jannat-ul-Baqqi is the grave of Syedna Usman (RA). Syedna Usman (RA) helped muslims and Islam with his wealth (He was very wealthy man) and life. Two daughters of Prophet Muhammad (S. A. W.) were married with him (RA). 2 . Syedna Usman (RA) was the model of purity and shyness. Once Prophet Muhammad (S. A. W.) was sitting and his lower part of clothing was slightly up and there was legally no-fault according to Islam. After that Syedna Abu Bakar (RA) and Syedna Umer(RA) came and Prophet did not care but when Syedna Usman (RA) came, Prophet(S. A. W.) covered whole his leg. After their departure, Syeda Aisha (RA)inquired, "why he (S. A. W.) did so". Prophet (S. A. W.) replied, "Usman(RA) is model of pure shyness", and he (RA) is respected by angels, so why I (S. A. W.) should not do". 3 . 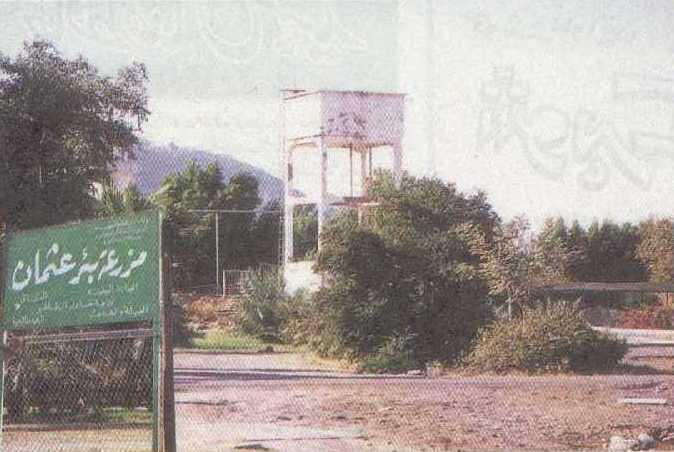 Syedna Usman (RA) purchased well and donated it to Muslims of Madina but history tells that the use of water of this well has been stopped for him (RA). He was killed (SHAHEED)and his (RA) grave is in Baqqi Grave Yard. Pilgrims must visit the grave of such a devoted personality of Islam. 4. syedna Usman is the first person who compiled holy Quran in the shape as we see today. 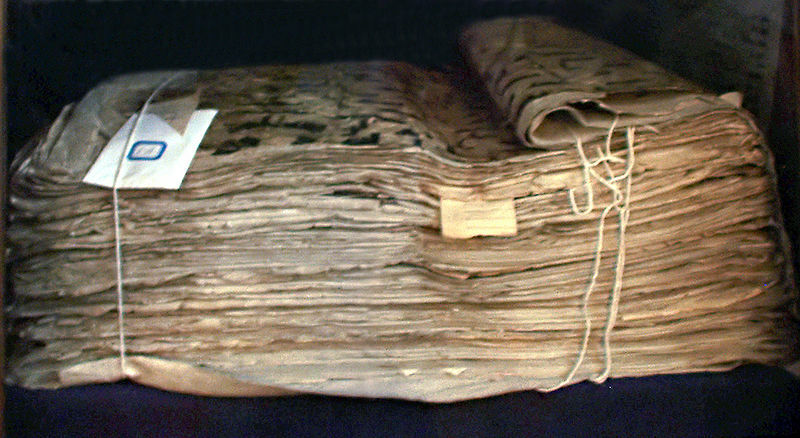 Before this Quranic ayatas were scattered and had been written on different objects. It is really a great work what he had did. Finding the gate of Uthman's palace strongly guarded by his supporters, the rebels climbed the back wall and snuck inside, leaving the guards on the gate unaware of what was going on inside. when the rebels entered his room and struck blows at his head. Naila, the wife of Uthman, threw herself on his body to protect him. 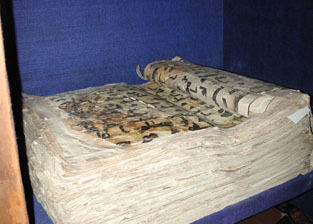 It is believed that this Qur'an present at museum in Toshkent, has the blood spots of Uthman. The slaves of Uthman then counterattacked the assassins and , in turn, killed them. There was further fighting between the rebels and the slaves of Uthman, with casualties on both sides, after which the rebels looted the house. After the assassination of Uthman, the rioters wanted to mutilate his body and were keen that he be denied burial. When some of the rioters came forward to mutilate the body of Uthman, his two widows, Nailah and Ramlah bint Sheibah, covered him, and raised loud cries which deterred the rioters. When the women raised loud lamentations over the body of Uthman, the rebels left the house and the supporters of Uthman at gate hearing it, entered, but it was too late. Thereafter the rioters maintained a presence round the house in order to prevent the dead body from being carried to the graveyard. After the body of Uthman had been in the house for three days, Naila, Uthman's wife, approached some of his supporters to help in his burial, but only about a dozen people responded. These included Marwan, Zayd ibn Thabit, 'Huwatib bin Alfarah, Jabir bin Muta'am, Abu Jahm bin Hudaifa, Hakim bin Hazam and Niyar bin Mukarram. The body was lifted at dusk, and because of the blockade, no coffin could be procured. The body was not washed, as Islamic teaching states that martyrs' bodies are not washed before burial. Thus Uthman was carried to the graveyard in the clothes that he was wearing at the time of his assassination. According to one account, permission was obtained from Ali to bury the body. According to another account, no permission was obtained, and the body was carried to the graveyard in secret. Yet a third account states that when the rioters came to know that the body was being carried to the graveyard they gathered to stone the funeral, but Ali forbade them to resort to any such act, and they withdrew. Some people say that Ali attended the funeral, but there is, however, overwhelming evidence to the effect that Ali did not. Naila followed the funeral with a lamp, but in order to maintain secrecy the lamp had to be extinguished. Naila was accompanied by some women including Ayesha, Uthman's daughter. The body was carried to Jannat al-Baqi, the Muslim graveyard.It appears that some people gathered there, and they resisted the burial of Uthman in the graveyard of the Muslims. 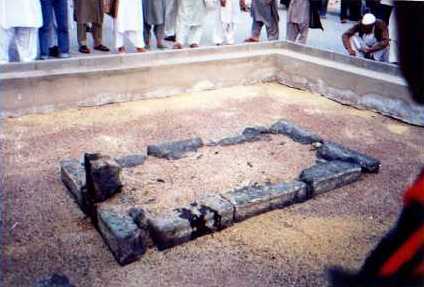 The supporters of Uthman insisted that the body should be buried in Jannat al-Baqi. They later buried him in the Jewish graveyard behind Jannat al-Baqi. Some decades later, the Omayyad rulers destroyed the wall of the Jewish cemetry and widened the Muslim graveyard to make his tomb inside. The funeral prayers were led by Jabir bin Muta'am, and the dead body was lowered into the grave without much of a ceremony. After burial, Naila the widow of Uthman and Ayesha the daughter of Uthman wanted to speak, but they were advised to remain quiet due to possible danger from the rioters. Caliph Uthman's empire at its peak, 655.